"This Zen Blunt Roller is perfect for rolling any sized wrap (up to 5in) or also rolling smokes up to king size (110mm). 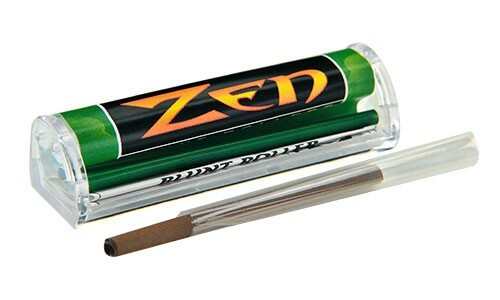 Zen Blunt Rolling Machines are made of high quality acrylic with perfectly sized aprons made of a material that will not stretch with age, and is coated to prevent cigarette paper tearing. They carefully design each Zen blunt roller to operate smoothly and create perfect evenly pressed cigarettes. The quality makes all the difference and is why Zen blunt rolling machines are the preferred roller of choice by smokers worldwide. These wrap rollers are made out of a quality acrylic that is much harder then the usual plastic that most rollers use." Instructions: # Pack the open machine lightly and uniformly then close. Make sure that no tobacco is caught between the rollers. # Give the roller nearest you one full turn downward. # Insert your favorite blunt wrap. Rotate nearest roller again until blunt wrap enters machine and begins to travel around 'tobacco' (LOL) # Roll gently and moisten the edge before it is drawn entirely into the machine. Now roll both rollers and remove a perfectly rolled cigar.